Li used diverse means of identifying key energy efficiency investments which lead to potential savings of more than $450,000. At Verizon, Louis Li decided to identify tactical energy efficiency opportunities for greening data centers and propose a long-term sustainability strategy to drive data centers towards a low carbon future. 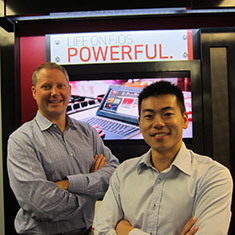 By collaborating with Verizon’s IT team, Li helped weave green management practices into the company’s operations. The teamwork led to the development of a methodology for tracking energy consumption of individual software applications, which in turn can be managed to save energy consumption and costs. Li also suggested metrics that incorporate energy costs in IT investment and resources management decisions, impacting both the bottom line and the environment. Overall, Louis’ proposals could save 3.3 million kilowatt hours and 1,000 metric tons of carbon emissions annually, in addition to more than $450,000 in net operating costs. These measures could also augment the proven operational reliability for a data center that serves premium institutional clients. Louis Li, a student at the University of California, Berkeley, was hired as the 2013 EDF Climate Corps fellow at Verizon.